Babson College is the educator, convener, and thought leader for Entrepreneurship of All Kinds™. As the only school to teach Entrepreneurial Thought and Action®, Babson shapes the leaders our world needs most: those with strong functional knowledge and the skills and vision to navigate change, accommodate ambiguity, surmount complexity, and motivate teams in a common purpose. Every day, Babson students, faculty, alumni, and staff address real-world business and societal problems, creating sustainable economic and social value in today’s fast-paced global economy. Babson operates several rounds of admission for each graduate program—evening, Fast- Track, and traditional MBAs. You'll have the best chance of acceptance if you apply early in the admissions cycle. There is no minimum GMAT score required for admission, though the average score for accepted applicants ranges between 590 and 660 each year. All prog...Babson operates several rounds of admission for each graduate program—evening, Fast- Track, and traditional MBAs. You'll have the best chance of acceptance if you apply early in the admissions cycle. There is no minimum GMAT score required for admission, though the average score for accepted applicants ranges between 590 and 660 each year. All programs require an admissions interview. Babson’s reputation within the Northeast is stellar, and the school often “teams up with BC, BU, Harvard, MIT, etc. to have events and network” (the national brand image is also “growing” at a nice clip, as helped by the San Francisco campus). There are plenty of meet and greets with different companies, info sessions, and CEO speeches that occur through­out the day for when one has time. However, many agree that the Babson Career Center “needs to do much more in ensuring that the international students who want jobs get placed with reputed companies.” In terms of application upon graduation, Babson does an excellent job at relating the entre­preneurial spirit to more than just a new business. 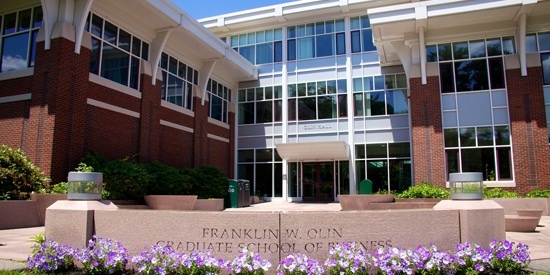 “From growing a small business, M&A or large business expanding in a new market, the general business acumen is excellent at all levels.” Students without jobs are encouraged to “take advantage of the powerful alumni network in every aspect possible!” Top employers of Babson graduates include Athenahealth, CVS Caremark, EMC, Cognizant, and Credit Suisse. At Babson's F.W. Olin Graduate School of Business, we expect from our students what they expect from themselves: to create economic and social value that reshapes the world, with a focus on Entrepreneurial Thought and Action and a commitment to people, profits, and the planet.Babson was the first to understand that entrepreneur is not a personality type, and the first to demonstrate that the ability to think and act entrepreneurially can be taught. When entrepreneurial skills are integrated with deep functional business knowledge across disciplines, you get graduates who are uniquely capable of making a difference in the world.The Babson MBA program reflects a new, unified curriculum through four different channels: One Year, Two Year, Evening and Fast Track. Babson is answering the critical need for Entrepreneurship of All Kinds to reshape our world. We are looking for talented, like-minded students to join in our quest to write an exciting chapter in global business and social responsibility. Are you one of them? The Babson MBA is grounded in our unique application of Entrepreneurial Thought and Action across business disciplines and tailored to meet the educational, professional, and personal needs of our diverse students. Babson serves as a living/learning laboratory, where curricular and cocurricular opportunities combine to provide mind-expanding instruction and hands-on experience. Students benefit from experiential learning opportunities, working as consultants or completing internships in the US or abroad. One-Year: designed for students who have earned undergraduate degrees in business. Two-Year: geared towards students who need a more comprehensive business focus to redirect their careers. Evening: Allows students the flexibility to earn a degree while working. Group peer tutoring is available to Full time students in their core at no cost. We also facilitate private peer tutoring (tutors approved by faculty) which is available upon request to any student; however students must pay for these private tutoring services themselves. Yes, the Center for WomenÂ’s Entrepreneurial Leadership (CWEL) at Babson College provides educational programs for undergraduate, graduate, and Babson Executive Education students to help develop leadership skills and an entrepreneurial mindset. CWEL also supports and widely disseminates research into the unique skills and experiences of women entrepreneurial leaders, and advances gender equality as a growth strategy for individuals and for organizations of all sizes, everywhere in the world. The Center, founded in 1999, was the first major comprehensive academic center focused on womenÂ’s leadership at a premier school of business. Mentoring Programs The CWEL MBA Mentor Program connects women graduate students to senior-level women leaders to build strategic relationships that support leadership development and career advancement. The program is built on three essential pillars: Expertise - designed and led by a faculty mentoring expert; Theory and Practice - offers the latest research on mentoring and entrepreneurial leadership development; Custom Matching - Students and mentors are strategically matched to provide a successful foundation for the mentoring experience of both parties. Additionally, CWEL provides a blended mentoring format combining virtual and on-campus programming to better meet the needs of non-residential students and geographically dispersed mentors. In the current academic year, 21 MBA students have been paired with mentors. Additionally, 58 undergraduate and graduate students were paired for peer mentoring. Conference Scholarships CWEL offers financial support for graduate students to attend business conferences in order to build networks and access role models in the greater Boston business ecosystem. In the current academic year, CWELÂ’s conference fund has provided tuition for 82 Babson students to attend business and leadership events. Entrepreneurs-in-Residence: Gail Simmons and Sara Gragnolati CWEL names leading entrepreneurs in their fields as Entrepreneurs-in-Residence (EIRs) to coach and guide MBA students. This yearÂ’s EIRs are Gail Simmons: Food & Wine Special Projects Director and judge on the hit TV show Â“Top ChefÂ”; and Sara Gragnolati, a 12-year veteran in the natural products industry and founder of Cocomama, gluten-free food products. As powerful role models, these women help BabsonÂ’s MBA women build self-efficacy as they demonstrate the thinking and action of entrepreneurial leadership. In-Residence collaborations have two parts: a standard set of CWEL-related activities and a customized set of activities based on the interests of the participant. Â“Women In Â…Â” Networking Events CWEL sponsors Â“Women in Finance,Â” Â“Women in Marketing,Â” and Â“Women in EntrepreneurshipÂ” dinners, organized and hosted by the Babson Association of Women MBAs. These events engage successful women leaders from each discipline in an evening of networking and career insight exchange with Babson women graduate students. Gender Balanced Entrepreneurship Forum In order to build entrepreneurial self-efficacyÂ—the belief that a studentÂ’s ability to be successful is enhanced by watching and learning from role modelsÂ—in the current 2012-2013 academic year, CWEL co-sponsored the first-ever, gender-balanced Babson Entrepreneurship Forum, featuring 18 women entrepreneur presenters. Executive-in-Residence Coaching Hours with Roslyn G. Daum Roslyn G. Daum, a former Partner of Choate, Hall & Stewart LLP specializing in providing counsel to venture capital firms regarding investments and buy-out transactions, regularly meets with MBA students to share her expertise and experience. In the current academic year, Daum has conducted personal coaching sessions with 20 students. Fast Track MBA Program Learning Community The Fast Track Learning Community convenes women students with faculty senior staff and business experts for women-focused receptions, panels, other programs. The program also provides coaching for its Fast Track MBA students. Alumni Connections: Â“Onboarding AlliesÂ” program CWEL sponsors a program that connects incoming women students with a recent program alumna who can share insights about her own experiences. The program consists of three email connections over 90 days. Beyond the 90-day formal program participants are encouraged to Â“stay in touchÂ” for ongoing support and feedback. Innovative Events: CWEL is a learning laboratory that offers a rich roster of events that build knowledge, develop leadership skills, and inspire entrepreneurial thought and action. Women Redefining Fashion Women Redefining Fashion is an exploration of how women entrepreneurs are innovating within the fashion industry, featuring up-and-coming designers challenging fashion's status quo, as well as runway models of all ages, sizes, ethnicity and sexual orientation. The event is hosted by fashion industry insider Sophia Chang, producer for the global hit TV show "Project Runway All Stars." Whitney Johnson: Disrupt Yourself A talk given by Whitney Johnson, a co-founder of Rose Park Advisors, Clayton Christensen's investment firm, and the author of Dare-Dream-Do: Remarkable Things Happen When You Dare to Dream. Gender Enlightened Film and Speakers Series Brings together students faculty and staff to screen gender-focused documentaries such as Miss Representation and The Bro Code and listen to nationally known gender experts. Research / Thought Leadership We are proud to report that over 22 faculty members are involved with gender-related research at Babson College, and have inspired a Gender Resource Task Force convening faculty, staff and students to discuss gender issues on campus and develop recommendations for action. Additionally, Babson initiated the Global Entrepreneurship Monitor (GEM) Women research Reports, as well as the DIANA Project: research reports on womenÂ’s approaches to acquiring financial and other resources as well as an information source for resource providers and policy-makers about the importance and advantages of support and investment in women-owned businesses. The Center has also completed projects regarding women in family business, womenÂ’s business centers, and women of color entrepreneurs; projects supported by the Babson Faculty Research Fund; and many more. Collaborations The list of Center collaborations and partnerships extends far beyond the following: AAUW (formerly the American Association of University Women), Catalyst, Center for Women and Enterprise (CWE), Center for WomenÂ’s Business Research (CWBR), Ernst & Young Entrepreneurial Winning Women Program, Forte Foundation, Global Banking Alliance for Women, National Council for Research on Women (NCRW), WAGE, Wellesley Centers for Women, and Women Impacting Public Policy (WIPP). Want more info about Babson College, Olin Graduate School of Business Part Time MBA? Get free advice from education experts and Noodle community members. What locations host classes for the part time MBA at Babson College?